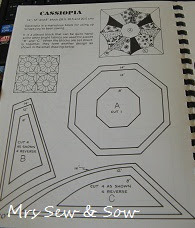 Old quilt books - but new to me 2! 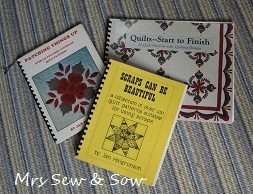 I recently bought these second hand books by Jan Halgrimson from Abebooks: Quilting - Start to Finish; Scraps Can Be Beautiful; and Patching Things Up. I posted about these books previously here ! 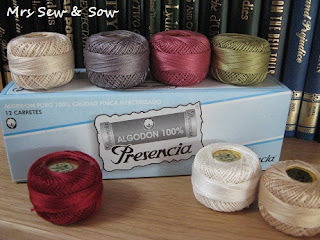 I am focussing on the third book Patching Things Up today. 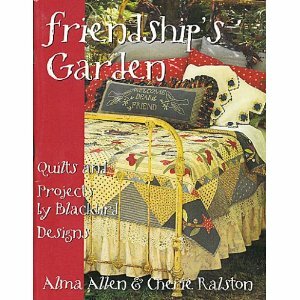 This book contains over 150 full size quilt patterns, many in two or three sizes, a mixture of pieced and applique designs. Here are a couple of my favourite designs, the first is called Cassiopia. 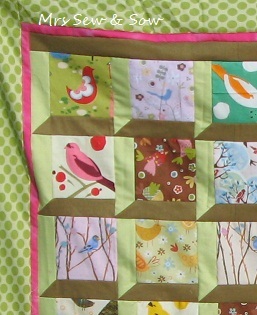 I like the background pattern made when the four blocks are put together, plus the fact that you can use up your small scraps making this design. This pattern is called Spinning Star and can be continuous or made into a hexagon - looks quite different depending on which setting is used. 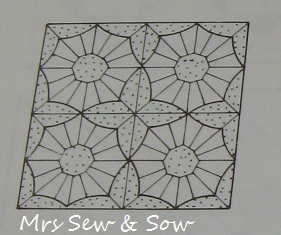 Both blocks have curved pieces so a bit more of a challenge and I would probably hand stitch these. This quilt top is big - to fit our king size bed. I may have overreached myself with taking on such a beast. It has certainly put me off layering and basting it. 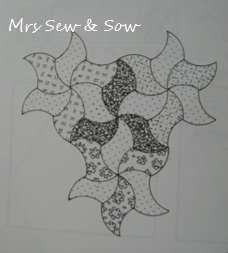 This is another quilt which started off in a Carolyn Forster workshop - the Jellyroll Sampler quilt! You can read more about that here in my original post. The wadding/batting is Hobbs heirloom 80/20 bleached cotton as the white fabric is not quite opaque - wouldn't want off-white wadding/batting showing through! This is the fabric I have chosen as the back of the quilt. A nice bright turquoise dottty fabric for a 1930's repro quilt. Along with this green and blue Anna Griffin fabric which will be the binding - when I get to that stage. I intend to quilt the outline of the blocks, but for the alternate plain white block, I fancy doing something traditional that will test my quilting skills! 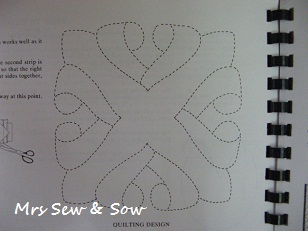 I bought this book, which you can get here, to help me find a pattern that would fit with the 30's era. Here are a couple of my current favourites. Which one(s) do you think I should use? 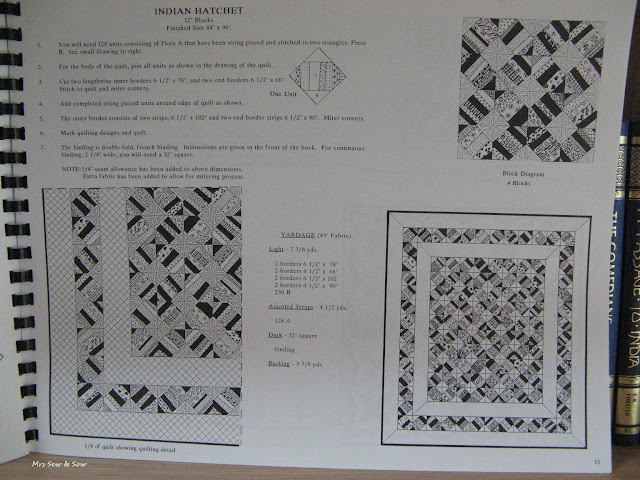 There are also triangles to quilt as the blocks are all on point so I need to be able to use half the design. 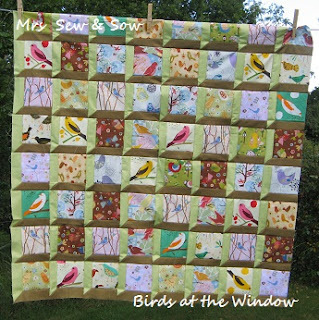 I may also quilt the narrow white border. 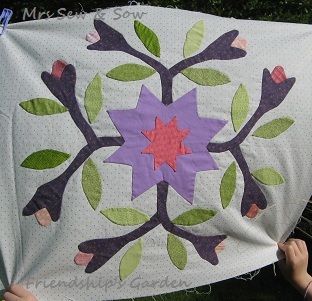 The pieced borders will either be outline quilted or maybe cross-hatched. More update on Birds in the Window! Sorry pictures are not great - evening sun! I spent the day getting my daughter's stuff ready for her first guide camp. Don't know who was more nervous? And I have just realised I need to square off my borders - oh dear I was in too much of a rush to take the photo! 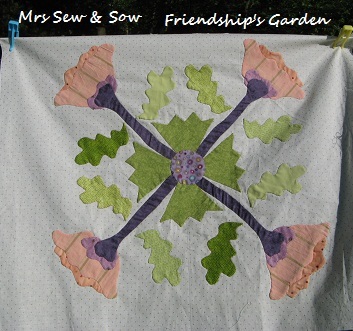 Now need to work on the back of this quilt - hope it comes together as easily! Old quilt books but new to me! I recently followed up something I read on Carolyn Forster's blog , about some out of print quilt books she has collected, written by Jan Halgrimson. I bought three of Jan's books through the services of Abebooks UK and am very happy with my purchases. One came from a book shop in the UK but the other two came all the way from the US. 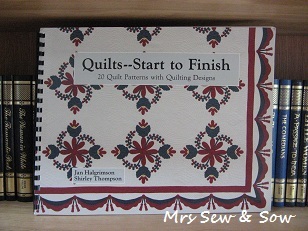 Quilts - start to finish has twenty quilt patterns with quilting designs included and is co-authored by Shirley Thompson. 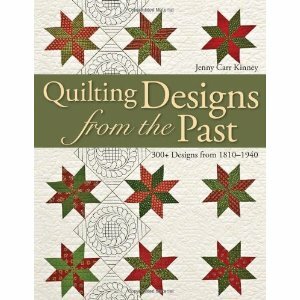 Do you like old quilting books and which ones would you recommend and why? I love our new books and am inspired by them but I do also love old books and wonder who owned them and whether they made anything from them - there are no marks to indicate anything on this one. I may be the first...? I want to enlarge the quilt a bit with one or maybe two border(s). Not sure what they will be made with yet but it cannot be the solids I have already used, as I have very little of those left - just enough to add one light strip to the right hand side and one dark strip to the top to finish those edges. I have quite a lot of the\ bird fabric left - although that might be better on the back of the quilt. I was thinking of introducing another solid colour - but which one? Yellow, fuschia pink.............or something else? I think you will find out soon as this top wants to be finished not left on the shelf for months like all those others. My friend Eloise and I visited the Cult of Beauty exhibition at the Victoria & Albert Museum in London on Sunday but after that our visit to London was not over! Oh no we like to make a day of it! 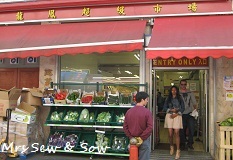 It was a chance for us to explore the wares here and to look for chinese script which we recognised. I have to tell you that there was a lot more that I didn't! 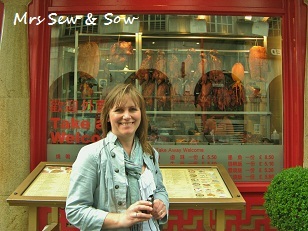 and one gorgeous little Chinese miss! 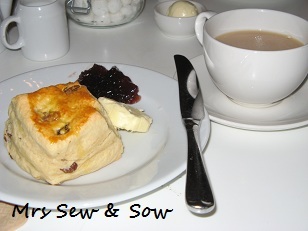 Another course with Carolyn Forster at the Quilt Room. 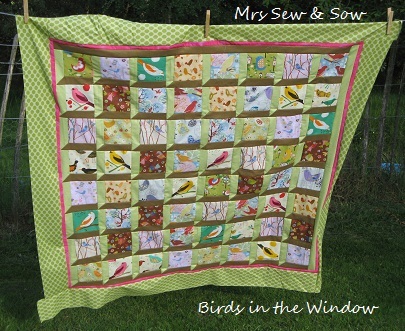 This was a lovely simple quilt to put together but I have gone and complicated things with my quilting which I am doing by hand. It has more detail than I would usually do as there are quite big areas of open space. 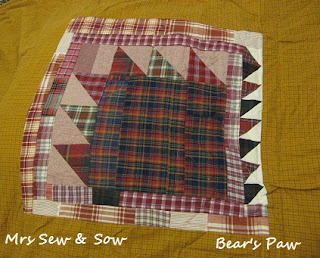 The fabrics in this quilt have an autumnal feel so I have quilted leaves with a small grid background. 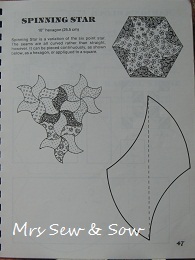 Unfortunately I seem to have misplaced the quilting stencil I was using so have not got any further. 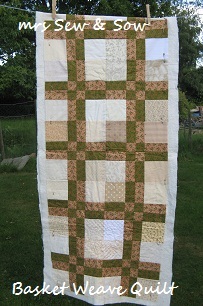 I am using the quilt as you go method and have pieced all the strips, layered and basted them. 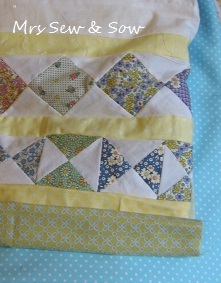 All I need to do to finish this project is lots of hand quilting on quite narrow pieces at a time. This makes it much more portable - maybe it could be a waiting in the car project. Then once they are all quilted I will stitch each row together. 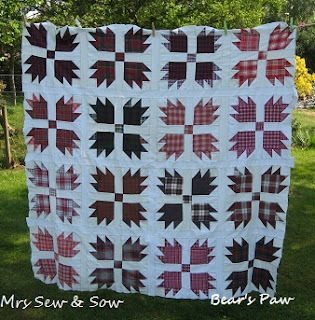 Must find that template so I can get this quilt finished or I could try and copy it from the two I have already quilted! Either way it should be finished for autumn....but which one 2011, 2012,...? 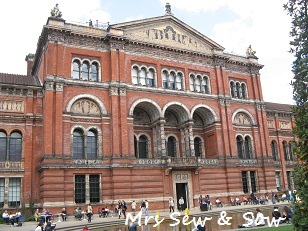 On Sunday my friend and I went up to London to visit the Cult of Beauty exhibition at the Victoria and Albert museum. The exhibition was about the Aesthetic movement, you know the Art for Art's sake lot and included artists, poets, designers, and playwrights among their numbers. 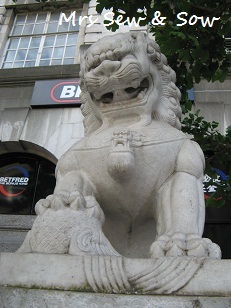 Famous names such as Rossetti, William Morris, Oscar Wilde and Edward Burne-Jones were all represented. 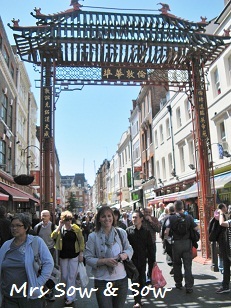 Sadly I can show you none of these things as photos are not allowed, but you can see some of the exhibits here! 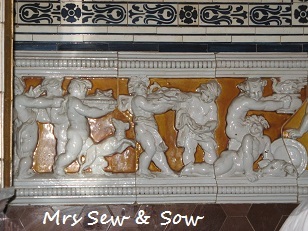 on the V & A site. 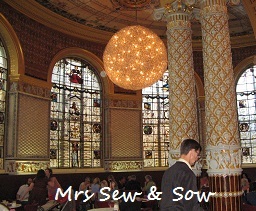 A beautiful and appropriate setting as it was contemporaneous with many of the exhibits we had just seen. We even had a young gentleman playing a grand piano while we refreshed ourselves. 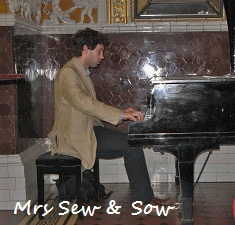 He played with confidence and feeling but without written music! Bravo! Here is a photo of this beautiful museum from the inner courtyard. This place is so rich in the crafts of Britain and indeed the rest of the world, throughout history from early times to modern. I have to say it is my favourite museum and it never fails to inspire me. I know lots of you make lovely stuff to eat in the kitchen but although I have a nice kitchen I only go in there when I have to - it means washing up, cleaning, cooking and those are rude words to me! But I have to make an exception every year when it is time to make something I like so much I willingly stay in the kitchen and make it several times over all in a short space of time! Intrigued? It makes use of a plant I like very much but it is not really that good looking. I have plenty of these in a paddock by the house. 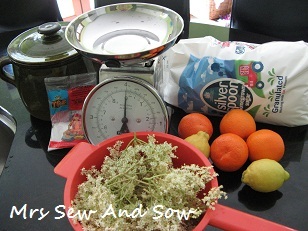 The plant is elder and I am making elderflower cordial! Did you guess right? And it couldn't be easier to make or I wouldn't be making it! 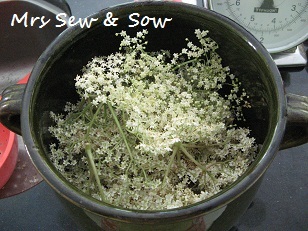 25-30 elder flower heads, picked early on a sunny morning. Choose those with the sweetest perfume and watch out for the pollen on your nose! 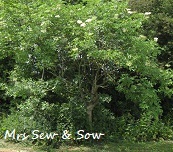 Clean up the flower heads - we don't want to add any little beasties to our cordial - I just shake them a bit over the sink, that usually dislodges anything. Place the flower heads in a non-metallic receptacle. I use a crock pot. 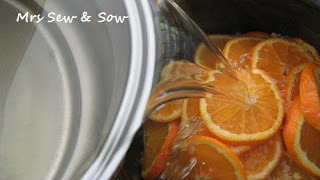 Once cool, pour in the sugar syrup and citric acid mixture. Cover and store in a cool place for 48 hours or there abouts, stirring from time to time. After the 48 hours strain your mixture through muslin or a fine meshed sieve and decant into clean sterilised bottles - I use empty wine bottles as I can sterilise them in the dishwasher! It says in my recipe, to freeze it until required, but I never have and we are all still alive, though once opened I do keep the bottle in the fridge. Remember to dilute, it is a cordial! 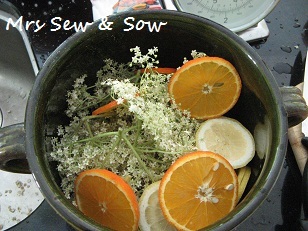 If you have a source of elder flowerheads near you but not near a road - we don't want lead added to our cordial - go picking and make this easy, quick, and refreshing summer drink. You can add tap water or for a bit of fizz sparkling water or even lemonade. Well worth the minimal effort. I collected lots of cute bird fabric last year to use for an attic window quilt. 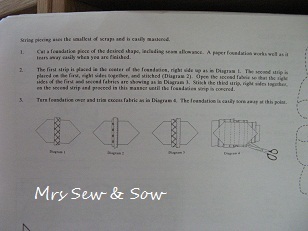 I have not done mitred corners before so thought that should be my next challenge! This is a new project for this year although I was planning it and buying for it last year. 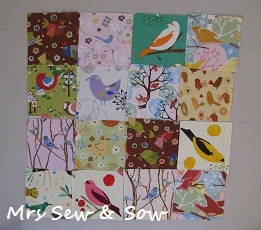 I was only intending to make a smallish quilt with these - about this size really. 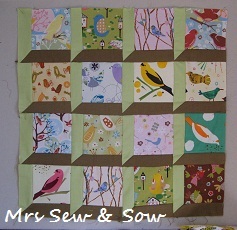 But I think I will make three more blocks like this! And maybe add a border or two! That will make a reasonably sized single quilt. 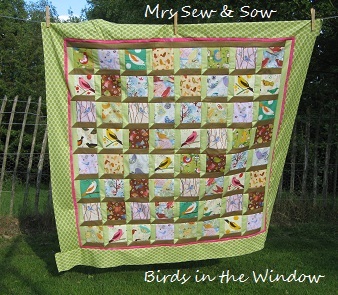 This one is made from recycled fabrics - shirts from charity shops and some new fabric (the lime and green stripe). 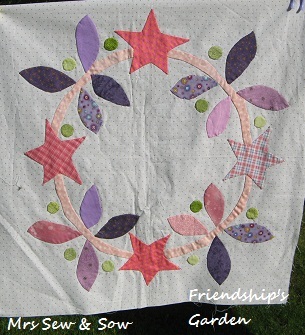 This project ground to a halt when I had to decide whether to applique the star onto a background or try to piece the background in. I'm leaning towards applique to give it a bit more strength but am open to suggestion...? I also want to make some small satellite stars to surround this bigger one so it need not be lonely anymore...! 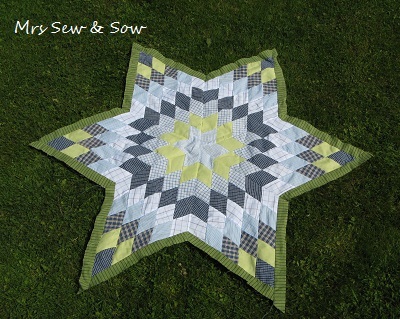 I like asymmetry so the star won't be central but will hopefully be balanced by the litttle stars....oooh I think I'm getting my mojo back on this one! Do you ever lose your way mid-project and if so how do you get back on track? 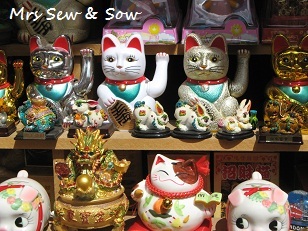 I think this blogging thing is good at getting me to take another look at these projects - seeing the photos on the page somehow gives me a bit of distance and I start seeing solutions rather than the many obstacles. I even start liking them again! That's a good thing - right?! Here is the latest progress on this quilt. 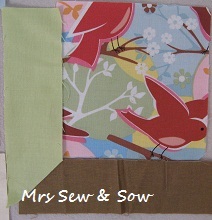 I have chosen my backing fabric - in line with the front it is bold and quite 'in yer face'! Is is too brutal? I think it goes with the art deco theme of the front and obviously with the dots! I am quilting this by hand - hand pieced, so hand quilted. 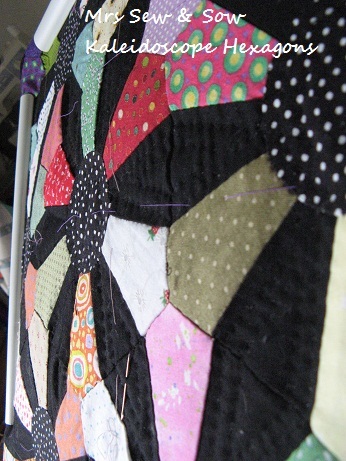 I haven't quilted in ages and after a dodgy start (on another quilt) I am finding this quite relaxing...ahhh! Cup of tea by my side, watching 'Spiral' - a gripping serial murder in French with subtitles on my laptop via BBC i-player! Bit gruesome but apparently good for quilting to?? I surprise myself! So far I have only quilted a few of the black areas in black quilting thread - don't know if I should quilt the coloured areas? and if I do what colour or pattern? Oh well still a long way to go to finish the black...can you just about see the quilted diamonds in the tumblers and there are two concentric circles in the dotty circle centres. Bit difficult to photograph this! 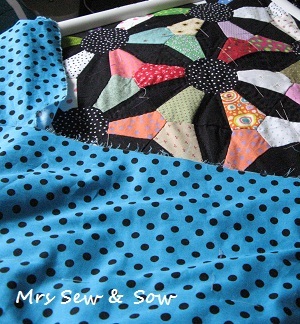 If you have any suggestions for quilting the coloured bits I would welcome them as I am a bit stuck for inspiration. 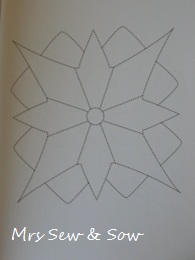 This last block is one I substituted for the middle block - a pot of flowers. I wanted to be able to turn the quilt round any way so did not want any directional blocks. 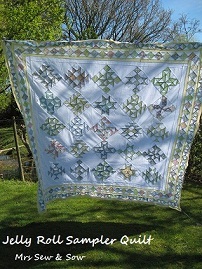 It fits in well with the others because it comes from the same designers just a different quilt. As I have posted there are nine blocks in total, sashed in HSTs and then a final applique border with swags and stars surrounding that. I have been challenged by Sue and Lori to finish up one block a month so I had better get on with the HST sashing hadn't I? 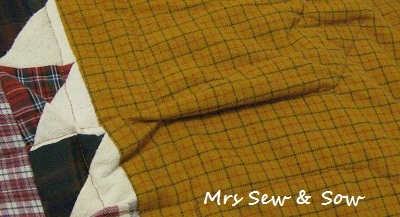 There was colour and the potential of beautiful utility stitches on my Bear's Paw Quilt. 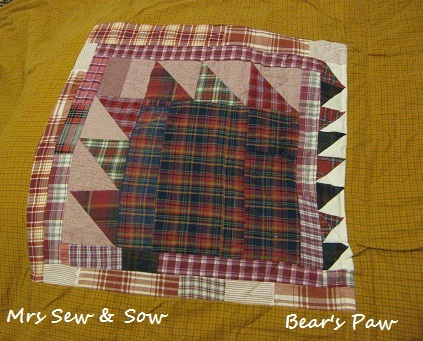 I started out quilting by machine but two layers of flannel and woollen batting meant I wasn't aware of what lurked at the back - and that is what was there! Great big lurking tucks and folds, which need unpicking before I can go back to my comfort zone of hand quilting in these lovely threads. If you were visiting yesterday you will have seen some baby mystery fruits - greengages and mulberries! Yum! Yum! If I remember, I will show you when they are ripe and yummier! So much garden in May! 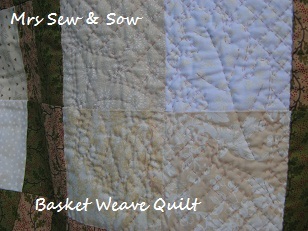 Utility quilts - photos from the workshop! It's not too late for Spring bunting!? 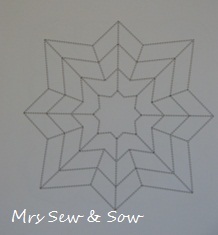 What to make with those granny squares! New to the stash - a bit more skirt!